Henna Blomroos did not disappoint in her stateside debut. The Finnish star was in control for most of round one at the Jonesboro Open before finding her first real trouble of the day on the tricky hole 18. A triple-bogey for Blomroos saw her drop from the lead into fourth, but still only three strokes off the pace. Despite putting only 50% from Circle 1X, Blomroos was near the top of the field in Circle 1 and Circle 2 in regulation, as well as fairway hits and parked shots. Blomroos is at 4-under par 62. Paige Pierce, playing on the live feature card with Blomroos, used a birdie on hole 18 to move into first at 7-under par 59. 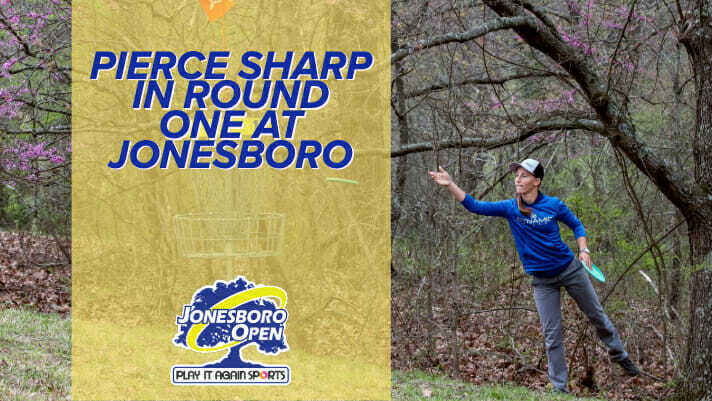 Pierce is the only Open Women’s player to record a sub-60 round at the Disc Side of Heaven since the Jonesboro Open joined the Disc Golf Pro Tour in 2017; her 1054-rated opening round 54 from last year being the other instance. She used the wide fairways and her big arm to limit the OB strokes and bogeys to one, tying Sarah Hokom for lowest above par rate in the division. Rebecca Cox and Catrina Allen did not let a strange end to their last tournament stick with them. Allen led or was tied for first in birdies and C1 and C2 in regulation. She is in second at 6-under par 60. Cox was dialed in on the putting green, finishing second in C1X putting at 82% and third in C2 putting at 60%, connecting on three from long range Friday. She is in third at 5-under par 61. There’s a lot of big names tied in fifth place at 3-under par 63, with Hokom, Paige Bjerkaas, Christina Linthicum, and Vanessa Van Dyken all still in the running heading into Saturday. Comments on "Pierce Shoots Sub-60 To Take Early Lead At Jonesboro"